I stroll into a two-story Forever21 at the mall and suddenly my head is spinning. The absurdly bright lights, blaring Dubstep, lurking sales associates, and racks on racks of clothes send me running. But, in the comfort of my home, or a coffee shop, or in the library, I get an email announcing free shipping and a sale—and I rejoice. This means no trip to the mall, wasted gas, parking, crowds, or lines. I can scan the store’s entire inventory with ease, and I don’t have to be hassled by sales reps touting that everything top or skirt I walk near “would be absolutely perfect” on me. But, searching for something on the Internet can sometimes feel jumping into the abyss. So, in the age of mass media and mountains of information, how do women navigate the world of online shopping? I find online shopping incredibly useful for two specific activities: finding a very specific product and simply perusing for leisure. Along with both of these comes an increased ability to find discounts. You can easily compare prices for the same product between websites, as well as access exclusive online sales and promotions, and find online coupon codes from sites like Retail Me Not (http://www.retailmenot.com/). Sometimes finding a very particular item—perhaps for a special occasion—can be difficult on the Internet. For women, however, it seems to be much more advantageous to search via social media sites like Pinterest, as opposed to using Google search. Because Pinterest is largely geared towards women and buying, it allows women to search in under the umbrella of popular items, unique products, and trendy clothes. While Google Search and its all-encompassing nature is great for everyday searching, sites like Pinterest seem to be more efficient for online shopping, especially when it comes to access and ease. Their web design—clean cut, square images, and brief descriptions—allows anyone to search millions of products and pins efficiently. I experienced serious frustration when searching for a particular formal gown that was out of stock on the original website where I discovered it. Google search was producing sketchy and irrelevant websites and the wrong style or color. A friend sent me a pin of the dress I had so fruitlessly been searching for. It was at a small boutique in St. Louis. The pin had the price, availability and location of my dress; I called that day to order it. In this way, Pinterest is an effective avenue for searching when online shopping. Discontinued makeup. Bulk vegan granola bars. A limited edition of your favorite novel. Indestructible phones cases for a fraction of the cost. Amazon has it all. And aptly named for the race of Amazon women, women love Amazon (that was a joke). Neither of those statements is true, but Amazon does have a lot offer in the world of online shopping, for both men or women. You can find nearly any product—new or used—and Amazon Prime often provides free 2-day shipping. Especially when looking to save money, I head to Amazon. I haven’t had a ton of success purchasing clothing from Amazon, but clothes are not the only things that women are looking to purchase online. They have shoes, beauty products, electronics—the list goes on. One time I went to a consignment store, and tried on 32 pairs of jeans—all different sizes, brands, fits, etc. There are a few things I will never ever buy online—jeans are one of them. Not being able to try on an article of clothing is one of the primary issues with online shopping. While some sites will ship you a return label ahead of time or always offer free shipping and returns (like Piperlime http://www.piperlime.com/), it’s frustrating receive a fabulous dress only to discover that it could sideline as a tent, or the latest addition to a toddler’s wardrobe. If I am partial to a particular brand, this makes online shopping much easier. If I know my size at a certain store, I don’t need to go and try it on; this is one of the biggest complaints for women in online shopping, specifically for shoes and clothing. Although I am partial to avoiding sales associates at retail stores, I find that if you are wanting assistance as you browse or having issues with a store, it’s nice to have a human with which to air you grievances. If you’re looking for feedback, shop with friend, not with someone who is paid by commission. 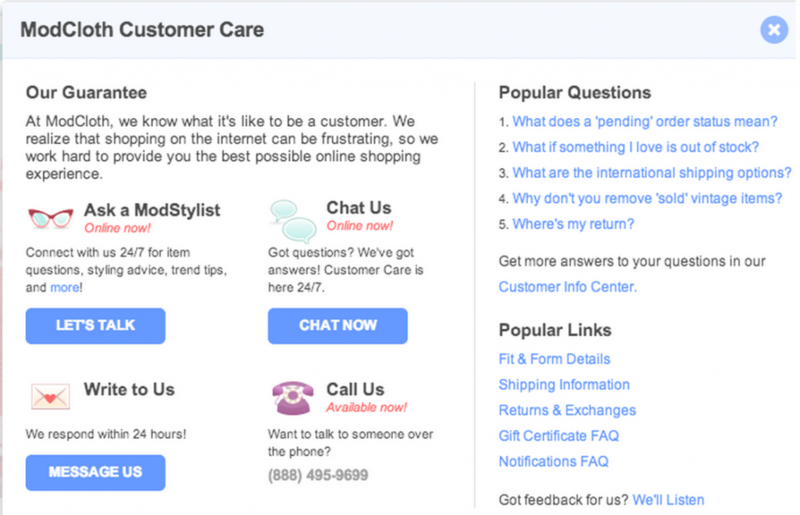 You can chat with a Modstylist OR customer service representative 24/7. Their email system guarantees a response within 24 hours, and if none of these options float your boat, then dial their digits for a phone call! I’ve had a great experience with their customer service; once I received the wrong size for a pair of shoes I needed to wear the following day, and after a ten-minute chat, the correct size was on its way for next-day delivery free of charge. I was also given a $10 gift card for the hassle! Many online stores are adding the live chat feature as a way to further streamline the online shopping process, such as Nordstrom, ASOS, and Nike, to name a few. Another benefit is the availability of advertising on the Internet. Stores that I like—enough to get at least one email a week from—I’ll subscribe to, in order to be notified of sales and promotions and receive exclusive discounts. While this doesn’t always motivate me to buy, free shipping, along with a sale or coupon code is usually enough to convince me I should do a little browsing. Social media only furthers companies’ abilities to advertise. In talking to women who were in their 30s and 40s, several said that they will click on Facebook ads to shop, especially when a sale is mentioned. Facebook, being the most commonly used social media site, seems to have mastered the art of ridiculously creepy advertising. By using your information, Facebook plasters ads “just for you” all over your feed and home page. Rarely do I follow these links, but occasionally they have notified me of important sales. These, however, are usually sites that I have “liked” on Facebook and already check frequently, or am subscribed to their email listserv. On a few occasions, Facebook has introduced me to new sites for online shopping; I discovered ModCloth by clicking on a Facebook ad. These, however, are usually sites that I have “liked” on Facebook and already check frequently, or am subscribed to their email listserv. If you’re looking to advertise or shop, Instagram is not the place to go. Due to its young demographic, businesses and shoppers alike will probably be disappointed with Instagram. For more information on this, check out my article about the psychology behind Instagram and why its not good for advertising: http://wojdylosocialmedia.com/psychology-instagram-can-used-business/. As previously mentioned, Pinterest is great for ideas and shopping, but before a few months ago, had no paid advertising. With their business account feature and new emphasis on small and large businesses, you can not only get inspiration from your favorite stores, but peruse local boutique’s selections. I like Pinterest for finding unique, inexpensive, fashionable clothes, and also food and beauty products, etc. Many pins provide a brief description that can operate as a sort of review for a product or a site. Pinterest is also chockfull of resources and strategies for budget shopping in any category. “Gift pins” reveal a price, an item’s availability, and location; if you like or repin one of these and the pin’s price drops, you will receive an email notification. These pins almost always link to a website where you can buy the product. While Pinterest is so female-friendly, and good for searching, sometimes pins are nothing more than a picture. When they don’t lead to a store’s site, I dub them “dead-end” pins. These are beautiful images of that perfect dress, that don’t lead to a place to purchase it. If Pinterest can eradicate these, they will be the go-to site for online shopping for women.